There are so many places in Brooklyn, New York, where I grew up, that can leave you wondering, at times, where you really are. Years ago, when I still lived there, I had a habit of walking each evening from about 9 PM until about 2 AM. On any given night you could find me wandering around the streets. It was my habit to walk the area bounded by Sheepshead Bay to the South, and Cortelyou Road to the North, where the subway leaves the elevated line and goes underground. My meanderings East and West were from Ocean Parkway to Flatbush Avenue, with a customary stop at the Wyckoff-Bennett House, pictured above, on East 22nd Street. The house is from 1763 and used to face South, it was moved sometime around 1900. When I was really little, we lived on Bedford Avenue and Kings Highway. It was 5 long blocks, but not too far to keep us from going there on Halloween. They gave out old silver dollars. This was about 1959. While in Kindergarten across the street at Public School 197, Ms. Gerber used to take us across Kings Highway (6 lanes!) to see the house and garden. She told us that George Washington had slept there and that these trees had seen him! When I got older and would take my nightly walks I used to enjoy standing beneath the huge old trees that adorned the sidewalk in front of the house. Their leafy canopies offered me shelter from whatever it was I was trying to walk away from. I would rest there and then continue on my nightly quest for, I'm not sure what. One evening, late, it was after dark, I found myself on the quietest street I could ever have imagined. It was called Oleans Street and could have been a lane in a small country town. I have thought often of the darkness and quiet beauty of this street over the many years since I left Brooklyn. I've often wondered how it got there, slanted amidst the neat rows of numbered and alphabetized streets that make up most of the borough. And while browsing the site Forgotten Brooklyn.com yesterday I got my answer. 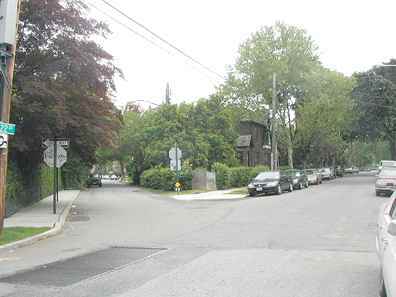 Oleans Street runs for 2 blocks between East 22nd and East 24th Streets, and diagonally between Avenues N and O. This came about as a result of Ocean Avenue being straightened. Older maps indicate that it was curved in several places until it became a main route that runs all the way to Sheepshead Bay. Oleans Street was, at one time, a part of Ocean Avenue. You can still see the overhead power lines for the old trolley in this picture. The most beautiful thing about this area were the gardens. I was raised in an apartment, and although my father kept window boxes of geraniums, we had nothing like these beautiful lawns and flower beds, which adorned the homes around Bedford Avenue, as well as my beloved Oleans Street. So, this was a magical place that I have always looked back upon with secret affection. I just didn't think anyone else knew about it! The streets of Brooklyn are a hodge-podge of history. The old Dutch names recall the times of the earliest settlements, some of which were in nearby Gravesend and Flatbush. I was never bored as a child, there was always somewhere to go, or something to see. The past still seemed present when I was a child. I'm not sure why, maybe it's the change in the weather, but I find myself looking back, more and more these last few days, to Brooklyn and the past. And though I know I'll never go back there, at least for any length of time, a part of me will always be walking those same streets, drinking it all in and remembering those walks. Still looking for, I'm not sure what..